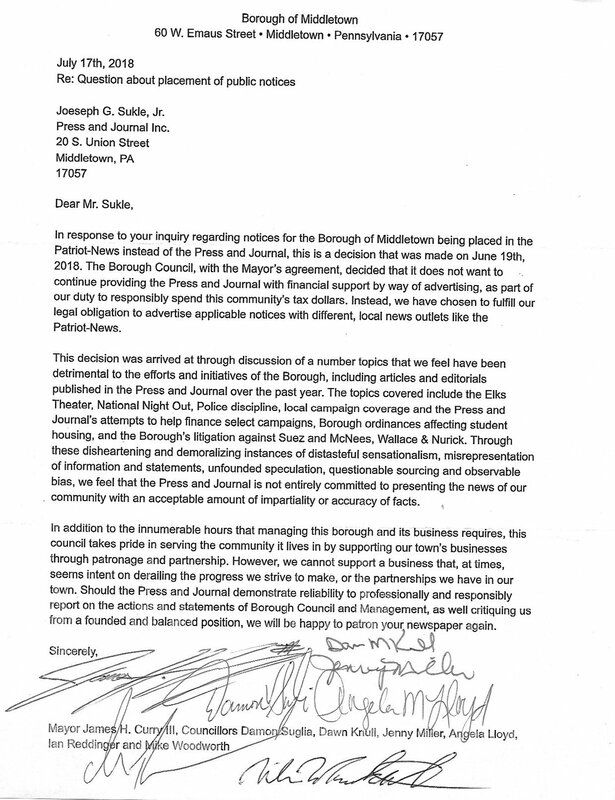 A signed letter from Borough of Middletown, Pennsylvania, council members and mayor explicitly links withdrawal of the borough's advertising dollars to what it considers "detrimental" editorial content. On March 19, the Borough of Middletown in Pennsylvania agreed to a settlement on a lawsuit filed by the Press & Journal, a local weekly. The newspaper sued after the mayor and borough council sent an official policy letter withdrawing advertising dollars from the Press & Journal in retaliation for the paper’s reporting and editorializing. Joseph Sukle, publisher and vice president of the Press & Journal, told the U.S. Press Freedom Tracker that there had been contentions with the borough over the last year or so. “I guess they didn’t like what we were reporting or the editorial viewpoints that we expressed, and then they just cut off all communications and not talking to us or our reporters, not commenting,” Sukle said. Sukle said he noticed that the borough stopped publishing public notices in the newspaper in June 2018. When he reached out to the borough to see if there was a problem, he was told he would shortly receive an official communication. In an effort to resolve the issue out of court, Aaron Martin, the newspaper’s attorney, appeared at a Sept. 18 borough council meeting to read a letter requesting a retraction of the policy letter. It argued that the council’s withdrawal of the borough’s advertising after a decades-long business relationship was a First Amendment violation. “This attempted punishment of a member of the free press—requiring a kind of probationary penitence prior to restoration—is a naked attempt to coerce favorable press coverage,” the letter reads. The Press & Journal provided copies of the letter to each council member and Mayor Curry. The paper asked that the council respond within seven days to its request in an effort to resolve the dispute out of court. Sukle told the Tracker that, in the end, they waited more than two weeks. On Oct. 23, 2018, the law firm of Mette, Evans & Woodside filed a federal civil rights lawsuit against the borough on the newspaper’s behalf, asserting violations of the Press & Journal’s rights to free speech and free press under the First Amendment. On Nov. 14, the borough attempted to have the suit dismissed. However, U.S. District Court Judge Christopher Conner ruled against the borough and denied its request for dismissal on Dec. 13, stating that while no formal contract existed between the borough and the Press & Journal, the borough had placed more than 200 notices over the previous 10 years, establishing a reasonable expectation of future business. Though government bodies are required to publish certain public notices in publications available to the populations they serve, there are no federally mandated guidelines. In order to not violate the first amendment rights of publications, government entities cannot take into account the content or viewpoint of the news service as a criteria for placing public notices. “Judge Conner’s decision will likely provide support to other media outlets facing retaliatory action by government for their reporting and editorializing,” Martin, the newspaper’s attorney, said in the Press & Journal’s editorial. Under the terms of the settlement reached in March, the borough is required to spell out its criteria for placing advertisements on bases that are “content-neutral and viewpoint-neutral consistent with the First Amendment of the United States Constitution.” Of the six council members who signed the official letter to the Press & Journal, five remain on the council that established these criteria through a resolution. Sukle, however, told the Tracker that the criteria are written in a way that excludes the Press & Journal because it is a weekly publication. Further, Sukle said, the mayor has continued to restrict the newspaper’s access, most significantly to the police department. “It’s gone so far that our staff—almost all of our staff—is blocked from the mayor’s Facebook pages, so we can’t access those,” Sukle said. The newspaper did not ask for damages in the suit, though the settlement did require that Middletown Borough pay $22,000 to the Press & Journal’s law firm for legal costs.